When Brian Watwood woke up in the hospital, doctors told him he was a quadriplegic. Three days earlier a car had slammed head-on into Brian as he was riding his bicycle home from a horse show 25 miles away. Brian’s face was mangled, his neck severely injured, and he was paralyzed from the chin down. Hearing the medical diagnosis was the low point in Brian’s life and he didn’t have much hope for the future. “I just figured, if you were a quadriplegic, you were a quad forever and you’d never move again,” Brian said. Hope didn’t come to Brian until about three weeks after the crash when, after several surgeries, something happened. The middle finger on his right hand began to move. “When my finger began to twitch, I new I was going to get better.” Brian said. Before the accident, Brian was an athlete. “Yes, I was a jock,” Brian said. In addition to his long-distance bike riding, Brian worked as a professional ski patrolman and became an expert in mountain search and rescue. He also competed in the national championships for down-river kayaking and was an avid tennis player. This competitive spirit played a key role in helping Brian pull through seven operations and months of grueling physical-therapy sessions. As his rehabilitation progressed, Brian was able to sit in a wheelchair – but sitting was about all he could do. “I felt so helpless, Brian said. “My hands could not grip the wheels.” Then one day, at the Santa Clara Valley Medical Center, Brian was attempting to get to one of the drinking fountains in his wheelchair. “I was so frustrated,” Brian said. “Then all of a sudden levers flashed through my brain.” At that moment, the idea was born for Brian’s invention – later known as the Wijit – a lever-activated device that allows wheelchair users to be independently mobile. After four months in medical facilities, Brian was able to go home. However, his rehabilitation was not over. He was still wearing the halo, he was still in his wheelchair, and he was still in need of more physical therapy to improve the functions and movements of his body. At home, the care for Brian was transferred to his wife, Robin. Brian cannot say enough about what his wife did for him. “She bathed me, she dressed me, she cooked for me, she drove me around,” Brian said. “She did everything for me.” He admits he probably wouldn’t have made it without her. Brian considers himself very fortunate considering the high stress involved in caring for a quadriplegic and the high divorce rate associated with it. With Brian’s Wijit, users propel, steer and stop their wheelchairs with their hands comfortably on the lever handles. The power from the lever and the Wijit’s special gears enable users to move their wheelchairs with only a small amount of effort. Using the Wijit’s levers opens up a whole new world for wheelchair users allowing them to better integrate into the general population. They interact more easily with people because they are sitting in an upright position rather than hunched over grabbing the wheels of a standard wheelchair. They don’t need gloves to protect their hands from pushing wheels, and they don’t get their hands dirty so they are free to greet people and shake their hands. It appears the U.S. government is also enthusiastic about Brian’s product. The Wijit is Medicare approved and is reimbursable through federal, state and private HMO’s. 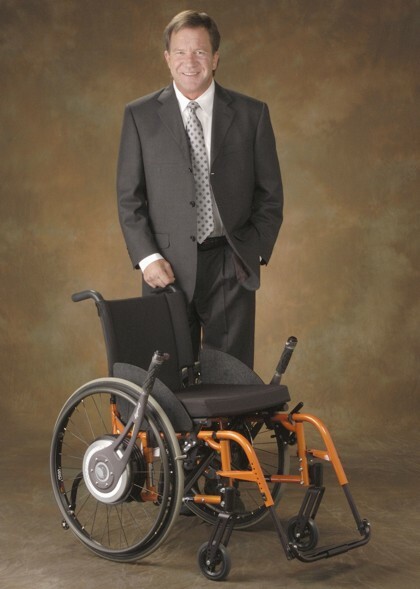 “The government realizes people get repetitive stress injuries from wheelchairs,” Brian said. The National Institute on Disability and Rehabilitation Research (NIDRR) conducted a study on wheelchairs and found that 60% of wheelchair users have injuries to their arms and shoulders. The NIDRR published their findings on how to improve wheelchairs and came up with 38 ideas for wheelchair improvements. According to Brian, most of these ideas were already incorporated into the Wijit. “The Wijit reduces repetitive stress injuries of the shoulders,” Brian said. The success of the Wijit has brought Brian considerable recognition. In early 1999, the TV show Dateline NBC featured Brian and the Wijit. This led to Brian’s induction into the National Hall of Fame for Persons with Disabilities, and to Superquad receiving the Equality-Dignity-Independence award from Easter Seals. The Wijit has received its own recognition. It was voted top product by HomeCare magazine and won the top award from Medtrade. The first user of the Wijit was Brian himself – he put it through rigorous testing. “It had to be simple,” Brian said. Although Brian is now able to walk unassisted except for a walking stick, he still has a problem with balance and his gait still shows he doesn’t have complete control of his legs. “When people see me walk, they probably think I’m drunk or on drugs,” Brian said. He’s able to drive a car with no special controls and he only relies on a wheelchair when considerable walking is required such as in airports. But using a wheelchair is no longer frustrating for Brian. In fact, it's actually kind of fun - thanks to the Wijit. For more information on Brian Watwood’s company Superquad and his product the Wijit, go to www.superquad.com.